The Savory Butcher is back with more deliveries to the Northwest – they are coming out about once a month to the area & they are getting ready to grow to more locations around the country too. If you haven’t heard us talk about them yet, The Savory Butcher is offering bulk meat that you can purchase online & then go pickup from a delivery truck at various locations around the Northwest. Yes, if you are thinking this sounds like Zaycon Fresh, which we talked about for years on our blog, then you are correct. It is the same concept as Zaycon Fresh, which unfortunately closed last June. So many of you loved the idea of Zaycon, where you buy your meat in bulk and skip the grocery store, buying directly from the delivery trucks coming from the farms, meaning lower prices for meat. The Savory Butcher company started in the fall of 2018 with deliveries in Utah, Idaho, WA & OR & they have been coming to the NW about every month since that time. They are doing a pilot program with these states initially before they expand to more states (which is coming very soon!). So, their goal is to continue to come every 4-6 weeks on a regular basis to the Northwest. We tried out the boneless chicken breasts in the fall & were definitely impressed with the meat. My family ordered the boneless skinless chicken breasts & they were true to their word, in that the chicken was pre-trimmed. No need to spend hours trimming all the fat off the chicken – what a relief! My friend also got the chicken & the bacon (see her picture above) & she was impressed as well. 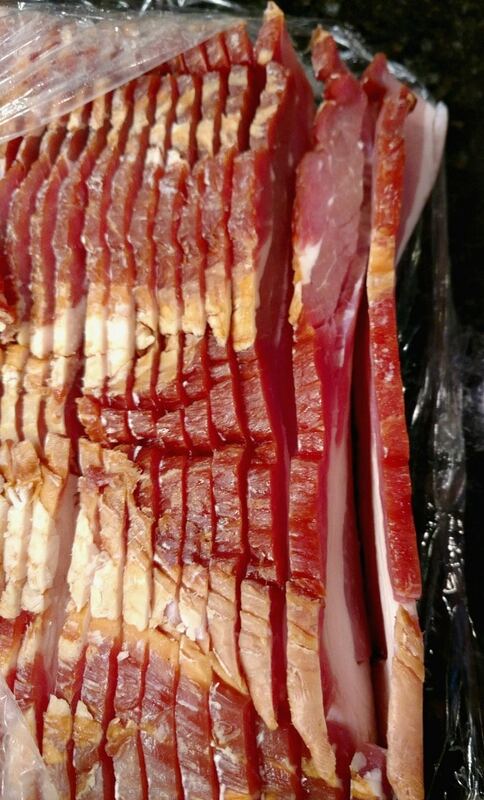 The hardwood smoked bacon is back to the original source that Zaycon used to use years ago. 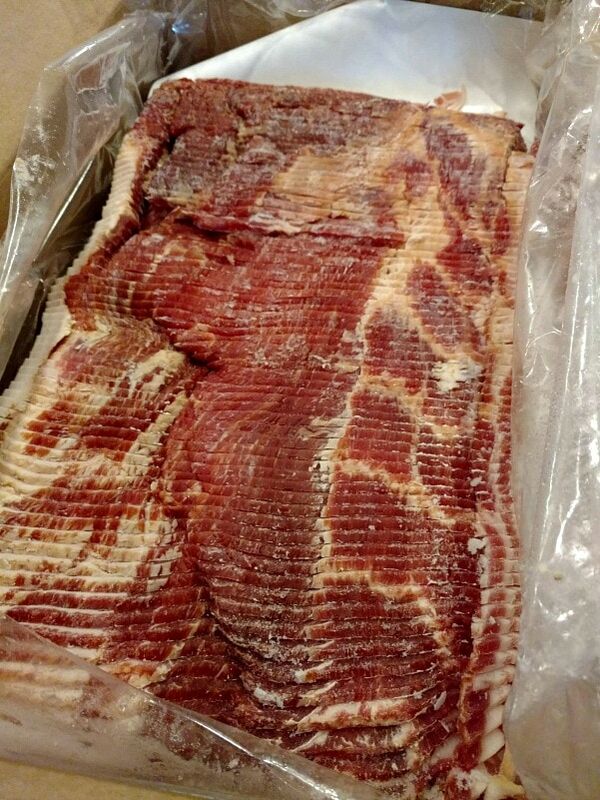 The bacon is high quality bacon & it’s the thick sliced bacon, as you can see pictured above! They are also offering uncured bacon as another option to choose from if you prefer uncured bacon. They also recently released fresh, Organic Boneless Chicken Breast! I know this is what many of you have been waiting for, to find organic chicken in bulk. Plus, they now also have Boneless Applewood Smoked Ham, too! 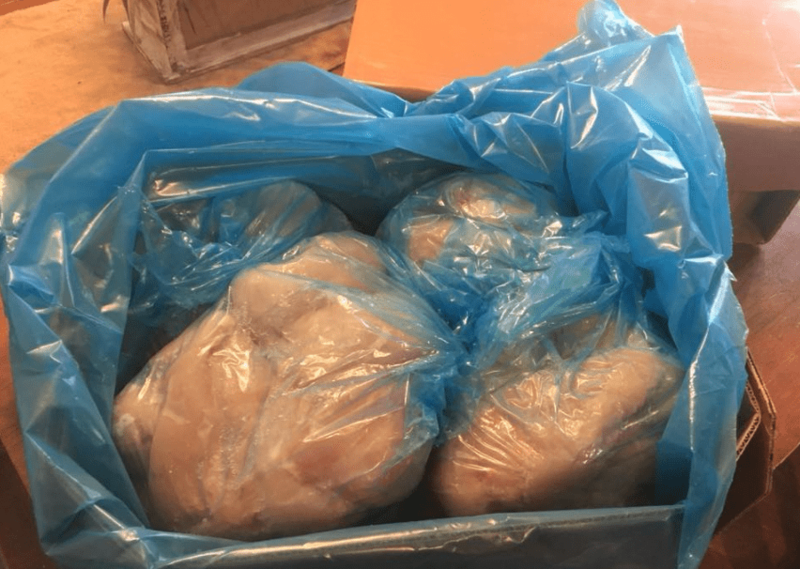 The bulk meat deliveries has been so popular this fall in the Northwest, that most of the items were selling out within 24 hours of the order window going live. So, in order to give more people the opportunity to order while they are still in the smaller, pilot program, the Savory Butcher has started a new Reservation System. If you’re interested, you can make a $10 deposit per case. This will ensure that you will get the products you want most & you won’t miss that window when the sale goes live in case any of the products sell out within a few hours as has been happening. 48 hours before the balance is charged, you will be notified in case you want to make any changes to the order. When the sale opens to everyone 7 days before the first delivery date, if you have paid the $10 deposit, then you will be charged the balance. This new reservation system is a great way that you can have more time to plan & figure out what products you will need & then ensure you will be able to order them when the order block of time is open. But they did not want customers to have to pay full price until very close to the delivery date, which is why it’s a $10 reservation per case that you order. I love that they are offering this as I was out running errands a few times & missed the first few hours of the sale & missed out on the bacon, which was definitely the fastest seller. Where is the Savory Butcher Coming? The Savory Butcher will be open for ordering one week before their delivery date for Western WA & Western Oregon. However, you can now make a reservation for your order a month ahead of time with a deposit of $10 & you will be charged the rest of the amount a week before the delivery time. So, you only have to wait one week from when you order & pay until when you will pick up your order. They are now delivering to Washington, Oregon, Idaho and Utah monthly. You can go on now & see the times for delivery and reserve your order for the next month. Washington, Oregon, Idaho & Utah – Ordering starts one week before delivery & they do come each month now. You can either reserve your order up to a month ahead of time with a $10 deposit & pay the remaining amount a week before delivery. Or you can make your order when they open a week before delivery. However, they have been selling out on their deliveries to WA & OR especially before the order delivery window opens, so I’d suggest making a reservation for the $10 deposit to hold your spot if you want to make sure to not miss it. They are also beginning to make deliveries in other areas as well including Arizona & Colorado and will be expanding to more states as they find more interest. Read on to find out more information about how it all works & about the company below — and if you want to try out the Savory Butcher & have them come to your area, they need you to sign up on this form. They need at least 40 people in each area to make a delivery in that area — so you will want to tell all your friends to sign up as well so that a delivery can be made close to you! The way the Savory Butcher company works is that it is like a co-op. It is the power of group buying in bulk. Basically, a large group of people in one area come together as a community & each claim part of the bulk order, so the prices drop to that which a grocery store or warehouse store would purchase the product for. They purchase the meat in large boxes (like the 40 lb boxes of chicken). Instead of repackaging the meat into their own packages & then increasing the price, you are bypassing the grocery stores by buying the meat in bulk as it comes from the farm on delivery trucks. You will meet the delivery truck at a predetermined location & drive up to pick up your meat in a bulk box (such as 40 lbs for the chicken). You can then repackage it in sizes that work for your family. In order to make this work like a co-op, they have to generate enough commitments in one area to be able to have the power of group buying in bulk to get the meat at lower prices than the stores. These are the highest quality of meats from the stores (always fresh) but at the lowest price. How Is Savory Butcher Different? New Options – The Savory Butcher will soon be adding options for organic chicken, 100% grass fed beef & uncured bacon. This was never offered by Zaycon & it is rare to see discounts on these products as they are expensive. But using this bulk group buying program, they will be able to offer these products soon. The meat goes from the farm to your trunk in just several days in a refrigerated truck. The meat is never frozen but fresh from the farm. Founders of the Savory Butcher? If you’re wondering about who has started this company, there are 2 founders. The first founder is Cassie Michaels, who is a fellow frugal blogger friend of ours, with The Thrifty Couple in Utah. I first met Cassie & her husband at a blogging conference many years ago in Colorado & have always had a lot of respect for them, so I was excited to hear that Cassie is one of the founders of this company. Cassie was a blogger who was contracted to work with Zaycon as a liason between the company & bloggers to give us information about the sales to share with our readers after she was a customer of Zaycon for 8 years. So, she knows the ins & outs of how Zaycon worked, as well as the issues that it faced once it was bought out by investors several years ago. The other founder of the Savory Butcher is Erle Adams. Erle worked with Zaycon for a little over a year in 2017 as a liason between Zaycon & bloggers. He also knows well the ins & outs of how the process worked with purchasing the bulk meats but also how to stay away from the issues that faced Zaycon. They are committed to keeping the company as grass-roots – meaning no investors (which was the downfall of Zaycon). They decided to create this company after seeing how disappointed so many people were in the closure of Zaycon, but also seeing the issues it faced in its last year or two. So, they wanted to create a new company with the same group buying power of buying meat in bulk, but with changes to make it a much better experience for the customers. Let us know what questions you may have about this new company & we can help explain more about it! I tried it out in October & will be trying it again in March & had a great experience! I am interested in organic chicken. The question I have about the grass-fed meat is: Are the animals grass-finished as well as grass-fed? Hi Geri – They are still in the process of looking at the organic options, since those wouldn’t be launched till the new year, but we will ask those questions when they do launch it. Thanks! Do they taste food stamps? That would be awesome if they do. They have applied to the government to be able to take food stamps, but it is a several month application process, so it’s not available at this time, but hopefully for one of their future deliveries soon. Where is the meat coming from?